We seem to have succumbed to late onset camping. After years of package holidays and comfortable hotels we have become tentists. It is probably something to do with having children and dogs. They are expensive and inconvenient. Taking them to a hotel is crippling to the bank balance, especially when they are old enough to wise up to putting things on the room number (the children, not the dogs. Dogs never concern themselves with things as mundane as money). It was time to do some affordable holidaying, with a measure of toughening ourselves and our children up. A tent was purchased along with all the other paraphernalia of camping. This, when piled up together looked alarmingly like way too much to fit in our car along with us, two dogs and something for us all to eat and drink. With judicious and careful packing we all fitted in and we set off on our summer adventures. 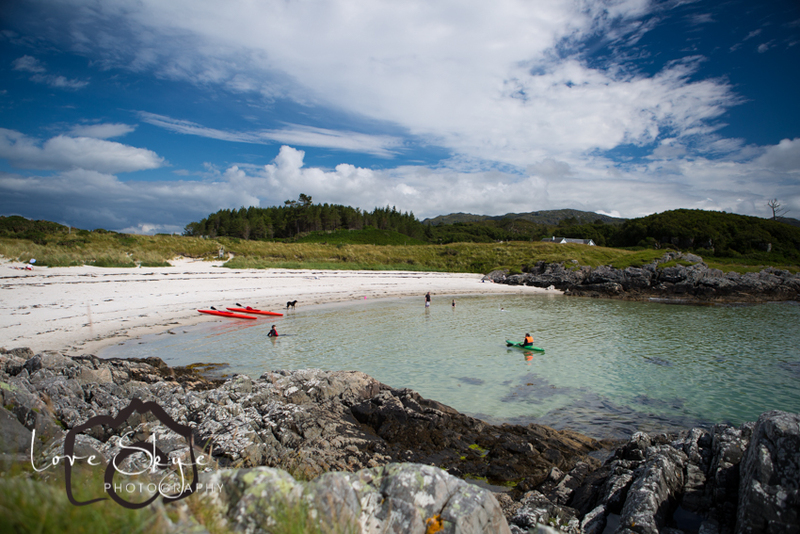 We headed north and visited several campsites along the west coast of Scotland. It was fun and beautiful to look at but the best adventure was closer to home. Camusdarach can be seen from Skye. 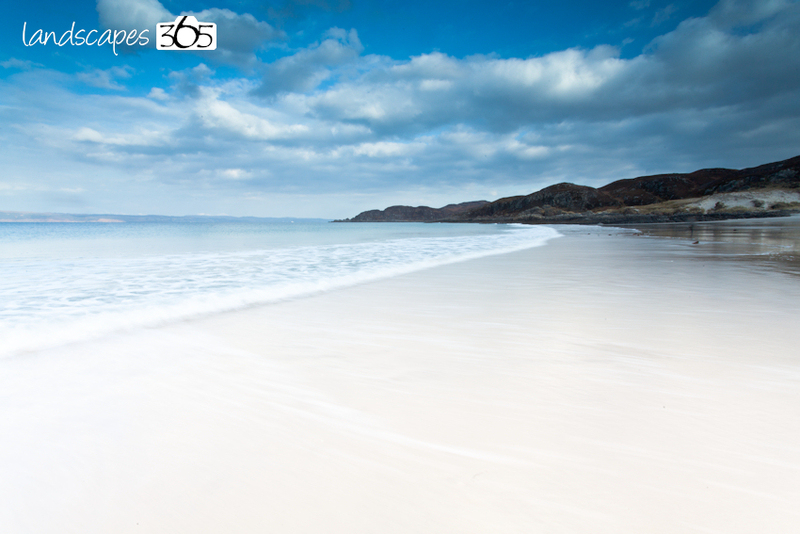 We have sat at Armadale pier having coffee and ice cream many times looking across at the white sands of Morar and said “that looks nice…” but only visited once. It was in the middle of February. 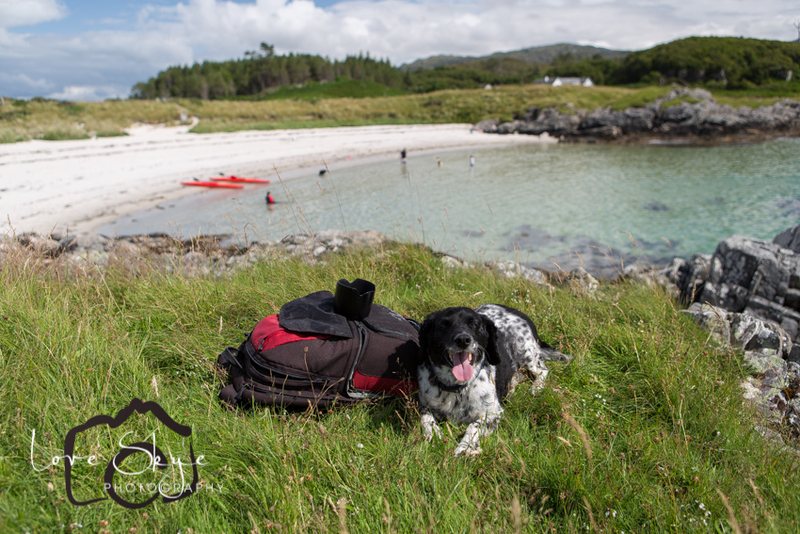 We were taking part in a reconnaissance for a wedding that Rosie was shooting in the Spring on the beach. It was, unsurprisingly, cold and a bit rainy. We still liked it though. It has presence. Not far from our pitch was a little gate that opened onto a narrow path that wove it’s way through bushes and ferns a short way down to the magnificent beaches of Morar, made famous by the film Local Hero. Well they are famous to people old enough to remember Local Hero. I’ve found there is a bit of a generational gap in knowledge when it comes to that particular film. It’s only people of a certain age who recollect the film and it’s evocative music. If you haven’t seen it I can highly recommend it. We left the famous big beaches to everybody else and chose to frequent the smaller beaches that were closer to the campsite. I think the highest head count on our beach was about 15 souls (plus dogs). We spent two days in our sandy cove either sunbathing, swimming in the slightly bracing sea or searching for errant dogs. Our dogs preferred sniffing for rabbits in the dunes or heading further afield to see if other families had brought a packed lunch with them. It was glorious. As we sat on our tartan travel rug with our cool bag full of Mallaig Co-Op’s finest fare we could look down the beach to the sea, the shore of which was being thrashed to a foaming frenzy by our children and dogs. 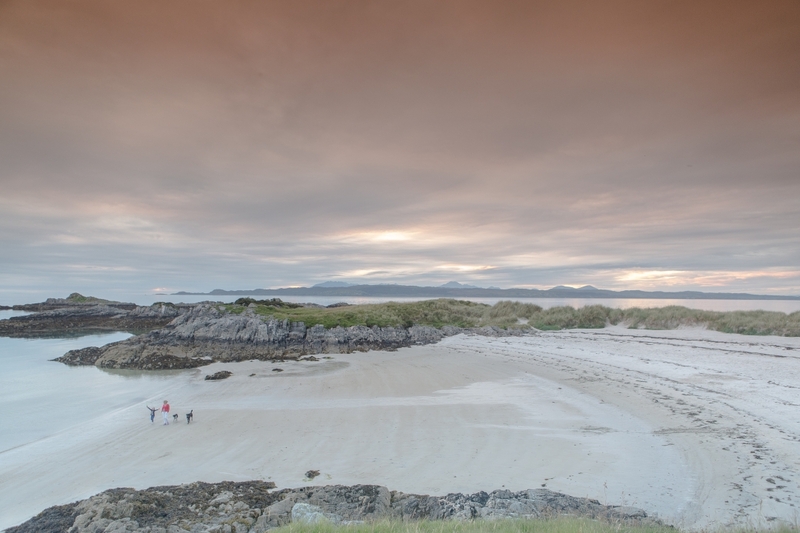 They were oblivious the beautiful islands of Eigg and Rum behind them shimmering in the heat. It was sublime. I would almost go as far as to say relaxing. Almost but not quite. There was still the constant supervision of and negotiations with children. I fondly look forward to our offspring’s teenage years when they lose the power of speech and the ability to do or care about anything. As an excellent example of how nice the staff of Camusdarach are I should own up to running our electric cool box through our car for too long and flattening it’s battery. Moments after my embarrassed visit to the site office (where you can get an excellent latte) someone was in attendance with jump leads. Thank you for that.